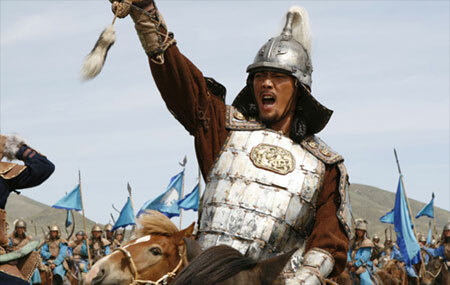 New movie "MONGOL" produced by Kazakstan, Russia, and Germany. The movie was directed by Sergei Bodrov from Russia. Nice, is there a thrailer availeble? Beautiful pictures, I wonder if it will be released in Canada? This makes me think I should save up and go to my cousin's wedding in Mongolia this summer, haha..
How much do they show? Is it just between China and Mongol? Do they show Persians as well? (Not the way 300 portrayed, I hope) Europeans? Will it ever be shown in America? I saw the movie a few weeks ago and really enjoyed it. I understand that it is part of a trilogy. Can't wait to see the other two.